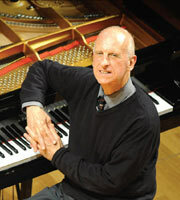 Roger Woodward is one of the most revered and adventurous pianists of our time. He has worked to great acclaim with most of the world’s celebrated orchestras and conductors, including Abbado, Mehta, Maazel, Dutoit. One of Australia’s One Hundred National Treasures, he was awarded Commander of the Order of Australia and Chevalier des art et des lettres in France. He is also recipient of the Goethe Prize in Germany. His concert appearances and recording activities continue to attract exceptional international reviews, confirming his place in the highest echelon of living pianists. Roger loves nothing more than to share his art with audiences and will be available for book/CD signings after the performance. This is an event not to be missed! Fine Music 102.5FM chat to the “King of the Keys” Roger Woodward. Visit Fine Music’s website here.